What does your inner goddess crave? Something sweet and sinful? Something tart and tangy? Something earthy and rich? My inner goddess is just the root of my outer desires. And I desire....everything. Just depends on the day...or on my mood. Sometimes I can't even decide, so I let fate guide me. While looking for a goddess goodie last night, my guide was my pantry. And my fridge. And my computer. What Nigella recipe could I find to satisfy my inner urges right then with ingredients I already had on hand (because I was not leaving the house. Nope. Wasn't gonna do it.) 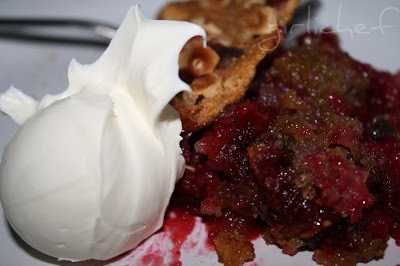 Luckily, I stock pile cranberries this time of year and I found a lusty sounding recipe for a pudding. A pudding that used orange oil as a flavor component. I didn't have any orange oil, but I happened to have some orange liqueur. Even better! This goddess was in business. And fortunately, I read the reviews of this recipe so that I knew that I was likely to get a heavenly mess at the bottom of my oven...which didn't convince me to use a bigger pan, because I think the goddess is a bit of a rebel, as well (throwing caution to the wind and all)...but I was wise enough to line the bottom with foil. Next time I'll use a bigger pan, too...but it didn't spoil the dish. Spilled it. Didn't spoil it. Cranberry Orange Pudding slightly adapted from Nigella Lawson yield: 4-6 svgs. 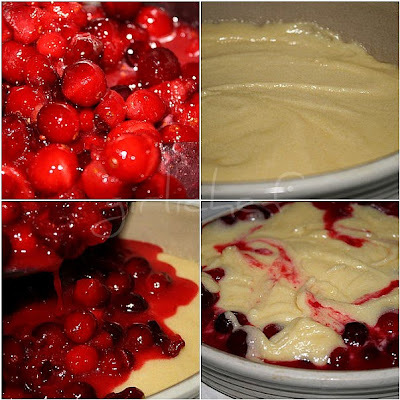 For the fruit: 1/2 stick unsalted butter 4 1/2 cups cranberries 3 tablespoons sugar I added a good splash of Cointreau For the batter: 1 1/4 cups flour 2 teaspoons baking powder 1/2 teaspoon baking soda 1 3/4 cups, plus 2 tablespoons sugar 2 eggs, beaten 1 stick unsalted butter, melted Few drops orange oil I used Cointreau 1/3 cup flaked almonds I actually used a couple handfuls of chopped hazelnuts Turbinado sugar, to sprinkle over Preheat the oven to 325 degrees F. Melt 1/2 stick butter in a wide saucepan, then add the cranberries and sugar and a good splash of orange liqueur. Cook over a fairly high heat until the fruit begins to pop. 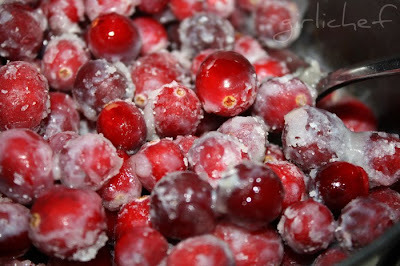 This will take hardly anytime if the cranberries are fresh, and about 10 minutes if they're frozen. Remove the pan from the heat. Combine the flour, baking powder, soda and sugar in a large bowl and add the eggs, melted butter and orange oil or liqueur. Mix until smooth. Pour half of the batter into a 2-pint round pie dish this is your subconscious...bigger one...use a bigger one... Cover with the cranberries, then top with the remaining batter; don't worry if the cranberries are not covered completely. Sprinkle flaked almonds or hazelnuts in my case and turbinado sugar on top... ...don't forget to line your oven with foil. Wanna know why? Because within 10 minutes, I heard drips hitting the bottom and starting to smell overly toasty...and smoke was pouring out the holes in the top of the stove...oh yeah, turn on the hood...extremely important. But I soldiered on. The goddess would not be beaten or deterred. Just see what happens. Bake for 45 minutes to 1 hour took mine 53 minutes, until the top is golden brown and set. See, good thing I soldiered on, because it was gorgeously, sinfully delicious! A crusty top and a gooey, rich and tangy center. About a bite of so in, I realized it would be good with a glop of homemade Mascarpone, as well. Oh yes, it was. More richness...but in a creamy, complimentary way! Our theme this week over at I Heart Cooking Clubs is Goddess Goodies...and this satisfied my inner goddess superbly. Join us or come on over to see what everyone else's inner (or outer) goddesses craved. OMG Thats amazing Heather....! Love love love it...I need to tap into my inner goddes fast...! This sounds incredible! I wish I had chosen this recipe this week. I made pigs in blankets. (I love bar food)! Came out just okay. Lots of the fun is in the trying! Your inner goddess is appeased once more. I love this phrase "I added a good splash of Cointreau". Ooops, it splashed on my fingers and is that a puddle on the counter... slurp. The cranberry orange combination is one of the nicest I know. This looks and sounds delicious. And the mascarpone? My God, that's too good to be true. i really can't believe how much i've grown to love cranberries in the last few years. this looks wonderful! Sounds soooo good! I really like tangy fruits... this looks terrific! My inner goddess wants so many things. At the moment, she seems undecided as to I should eat for dinner. I wish that I had read this post BEFORE I went to the grocery. The cranberry pudding definitely speaks to my inner godess. It looks wonderful! I am seriously drooling. This is one good looking desert. I probably would have freaked out when things started dripping. I definitely think this would help my inner goddess. but yours looks good too! Fabulous! I love the coming clean shots in the oven. I hope you told your husband that your inner goddess wanted HIM to clean the oven! Sounds very tasty indeed, good call on the cointreau and mascarpone - over the top! Oh hunny, i want some! shut the heck up! It's the side of mascaarpone that does it for me. Cranberries and oranges are my kind of food. I love how Orange Liquor (we like Grand Marnier) really makes such a difference - even a few drops. Congratulations on the Foodista announcement. That is so exciting; I'm very pleased for you. I'll be clicking those stars. The best part about lining the oven with foil? You can eat the parts that fall later on. Not possible if there's no lining! I stockpile cranberries as well. And this, apparently, is the reason why. It looks absolutely fantastic. Oh and orange liqueur - always better than orange oil. Always. All of your desserts are so amazinly done. Congratulations. I agree with you, I can crave anything and everything and it just depends on the day. This pudding looks fabulous! Do you just buy packages of fresh cranberries and throw them in the freezer? I need to do that. Heather, every time I think I've seen the best recipe on your site yet, you post another! Seriously, this one rules! I love the flavours, cranberry and orange, wow! Plus the addition of that great crunchy turbinado sugar, has to be amazing! Well goddess, you now have my inner goddess screaming, "I want some." Delicious - especially the spiolling over! Wow, this looks great! Especially since my husband does the dishes. I have a friend who makes cranberry and orange tarts. Oh gods - they are incredible! This looks amazing too! 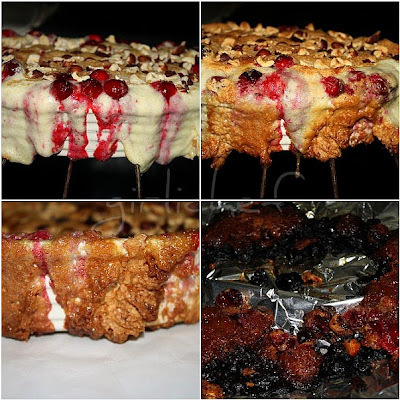 "Bake for 45 minutes to 1 hour took mine 53 minutes, "
This sounds absolutely delicious! Love the combo of cranberries and orange. This would be perfect for Christmas! I think we need to build an altar to your inner goddess. This sounds divine. LUUUV the changes you made!! I have to say I love your inner goddess. YUMMY! Would it be too much to ask to send my new camera to you and all my food so that you can take the pictures? I realize that I can be a pain. This looks amazing! 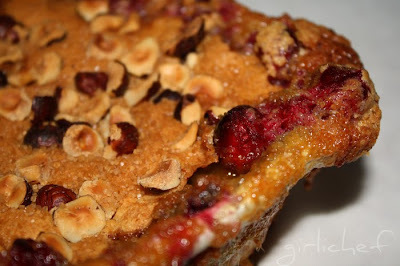 I love hazelnut, especially the idea of it combined with cranberries! 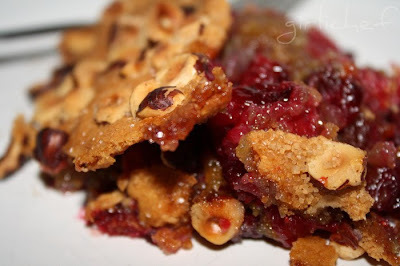 This sounds fantastic with cranberries & hazelnuts! LOL that spillage is too hysterical! But what a tart tart... you know I had to say that! Love anything and everything cranberry - I too stockpile them (at 6.50€ the package!) 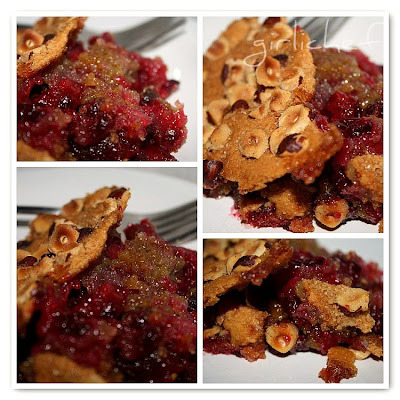 and this is a fabulous cranberry recipe! The orange- cranberry combination is one I really enjoy and very festive this time of year. This looks wonderful! these pictures are beautiful. I bet this tastes divine! I have 2-lbs of fresh cranberries in my refrigerator. I think I just found a great idea! Thanks. I was reading and then got down to the spilling over the edges, and clinched my teeth for you! I did that with my chocolate bourbon brownie pie at Thanksgiving and MAN what a mess that was to clean up! Perfection! In all it's messy glory. What a great dessert made from what you had on hand - my kitchen should be so well stocked. A very festive pudding! Love the combination of citrus and berry! This would definitely satisfy my cravings! Your photos are really stunning. 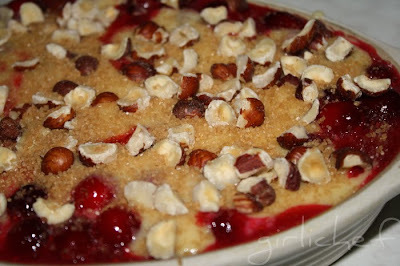 I love the hazelnuts in it, and that sugar-coated top is gorgeous! Yes, it all depends on my mood. This is what I am craving for now! This looks great! Beautiful pics of this one! But oh, I don't envy the drippy mess. :) But well worth it, it looks like! Oh man does that look good! No lie I had intended to make something else with my cranberries but now I just don't know. This one is calling my name. Orange and cranberry - a fabulous combination.